The 1-4x28 SWAT-AR Riflescope from Barska combines a weather-resistant housing and multicoated optics to create a day optic for close to mid-range targets. This scope features an etched Mil-Dot reticle that can be red or green illuminated to suit the shooting conditions. Red illumination will provide adequate contrast in low light and against a woodland landscape, green reticle illumination is better suited for daylight conditions. Reticle color and brightness are selected using a dedicated side turret. Locking tactical turrets enable impact point correction in 1/4" clicks. In addition to the range of features, an included cantilever ring mount makes the SWAT-AR ready for rail mounted use atop AR-style rifles. Box Dimensions (LxWxH) 11.3 x 3.65 x 3.55"
1-4x28 SWAT-AR Riflescope (Mil-Dot) is rated 4.7 out of 5 by 3. 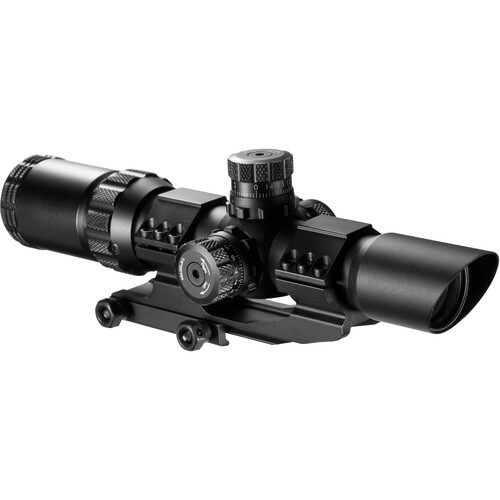 Rated 4 out of 5 by MustangLee from Nice quility scope For a low priced scope it is remarkably clear. The construction is rugged and appears to be high quality. I'm not saying this scope will compete with one costing several times more but for the price it's great. Rated 5 out of 5 by Cowboy from Great Scope I was a little skeptical about this piece of glass because of the price but, I was extremely surprised. This is one Great scope. Once it was zeroed in it was dead on at 200 yrds. I only put 200 rounds through it today and it held zero just fine, I plan on putting another 500 through it on friday and I'm expecting no less than what I experienced today. Thank you Barska for a GREAT SCOPE. Rated 5 out of 5 by Casey from Love it I've put a couple hundred shots through my AR and the scope has stayed right on the money at about 90yards. The only thing I would suggest is when you mount this scope to your rifle, make sure the 12 Allan head screws holding the scope to the mounting bracket are tight as well. After about the first 40 shots I had to tighten those up but they have stayed tight since. Awesome scope for the money!! What focal plane is this scope in? Where is the battery located on this scope? is this scope parallax free? Yes it is parallax free. Where the parallax turret would normally be is the adjustment for reticle color and brightness are selected using a dedicated side turret.